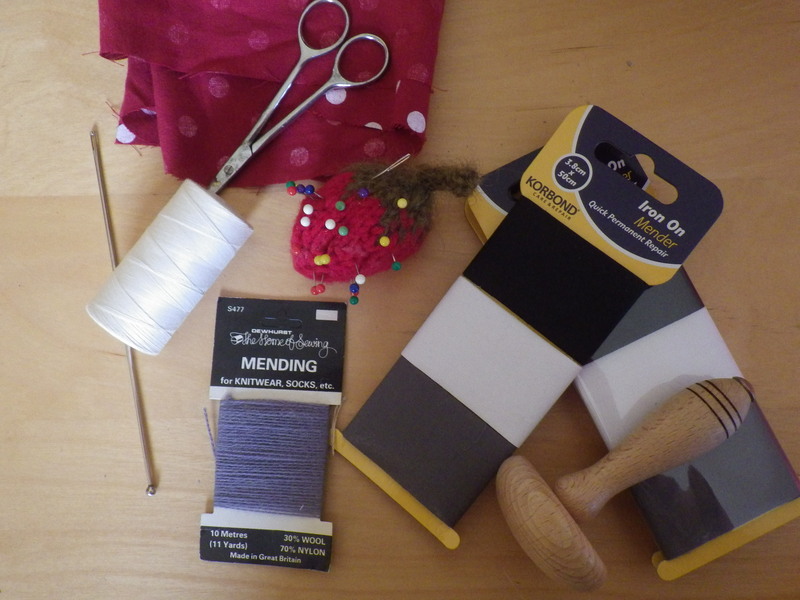 I’ve added several things to is since I first wrote about it, including more darning wool and a pack of Sugru (mouldable silicon glue), as recommended by Jen of Make do and Mend-able. Well, I’m delighted to say that it has. Although I’m still accumulating a pile of things that require me to get the sewing machine out to mend them, it did mean that when I noticed holes in a pair of Mr Snail’s hand-kitted socks, I actually mended them straight away. Out came the darning mushroom, darning wool and needle and the job was done relatively quickly. 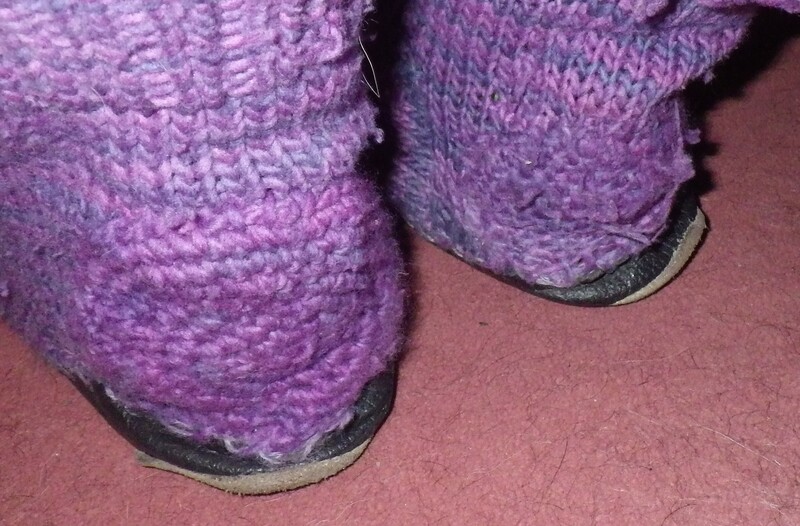 These socks were the first ones that I knitted for Mr Snail, so they are about four years old. I certainly wouldn’t darn bought socks, but it feels worthwhile to mend ones that I have made myself. Darning still isn’t my favourite activity, but I think I’ve made a pretty good job of it and it was certainly eased by not having to spend ages finding the necessary materials and equipment. So, have you mended anything this week? 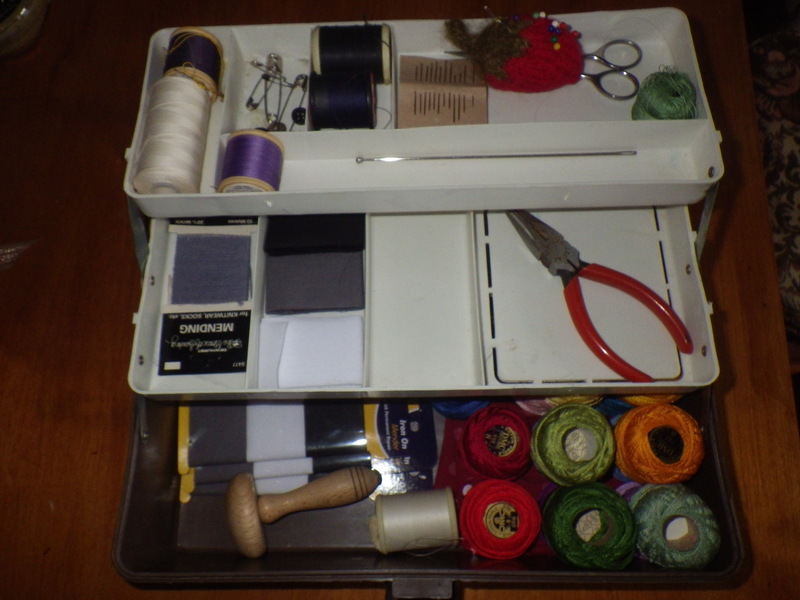 This is my little tool box, stocked with all sorts of things that can be used for stitching, darning, patching and generally making things last longer. I’m sure that I will add to it (especially since I know I have some other darning wool, but can’t seem to put my hand on it). I’m particularly pleased that everything in there, as well as the box itself, was already in the house. Now, I just need something to practice my boro skills on. So, on this final day of National Recycle Week, I’ve been reviewing my posts and considering the future. It’s clear that recycling is simply not enough – everyone of us needs to think about using fewer resources. Just because our governments’ only measure of success is ‘economic growth’ does not mean that we have to (literally!!) buy into this. There is no such thing as sustainability that supports ever increasing consumption of physical resources. We can, however, look for growth in happiness, creativity, friendship, green spaces, homegrown vegetables… any number of factors that could be increased and could benefit us as individuals and the planet as whole. I now know that I am not going to be able so save the planet single-highhandedly (goodbye dreams of my youth). And quite frankly, I don’t want to anymore – I want to be part of a team. Even so, I know there are still lots of things that I can do as an individual that will make a difference. The first practical thing I am going to do is to take Sharon’s advice and put together a mending kit. 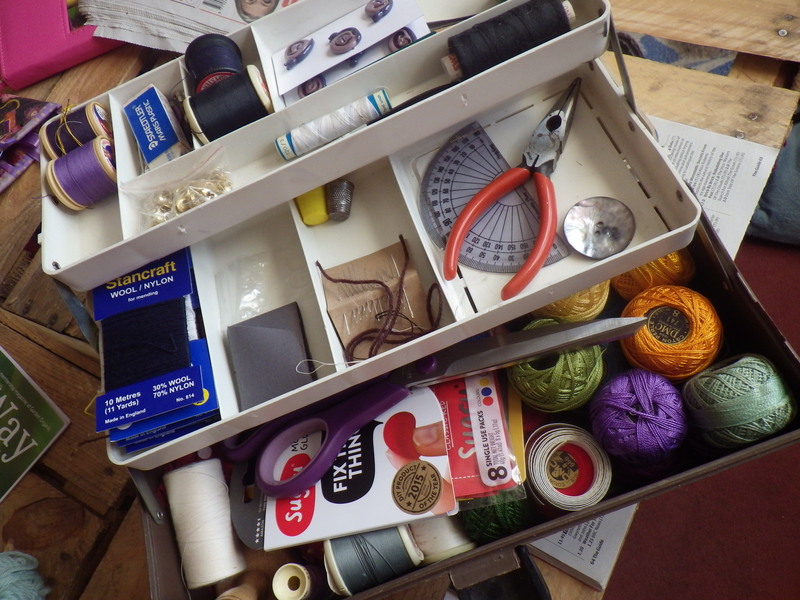 Perhaps my dislike of mending will be reduced (I can’t see that I’m ever going to come to love the activity, only the results) if I have a handy tool box containing all the bits and bobs I might need for patching, darning and repairing. Inside there are currently drawing pins, a bottle of ink, paper clips, treasury tags, a protractor and a few other bits and bobs that I haven’t seen for years because I haven’t opened it for years. These can join our main stash of such supplies and I’ll give it a good wash out. Next, I’ve started putting together a collection of useful things to go in it: darning wool, thread, small scissors, a darning mushroom, mending tape a rouleau needle (for threading elastic). I’ve also used a little knitted strawberry that Sharon herself sent me as a small pin cushion, to which I’ve also added a darning needle. What else should I include? All suggestions welcome. 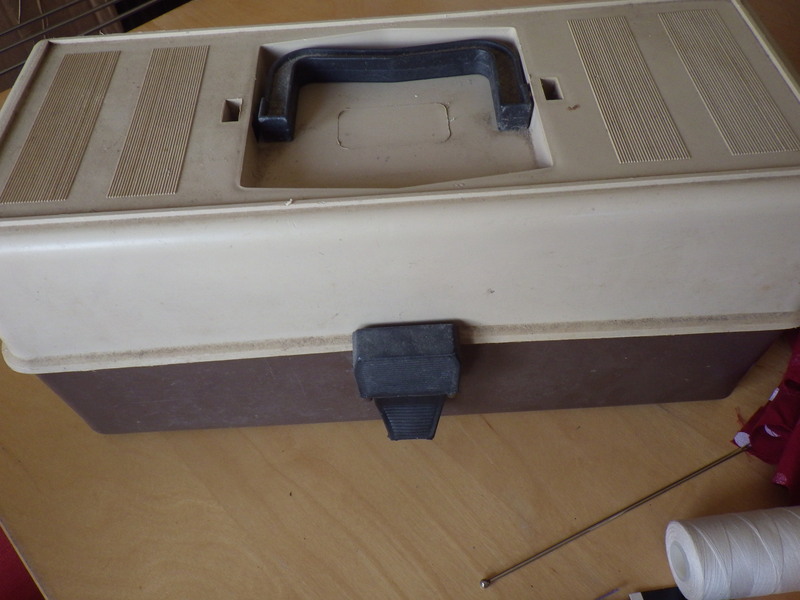 Do you have a mending box? If so, what do you keep in it? Other than this, I’m going to be thinking about future purchases a bit more, particularly in relation to plastics and composite objects, as these are not always easy to recycle. We are fast approaching ‘plastic-free July‘ and whilst I’m not planning to participate ‘officially’ it seems like a good time to consider the whole issue and, perhaps, make some more changes. Someone make a cake – we need to celebrate. Actually I should make a cake as all four chickens are in lay and so there are plenty of eggs. Dogs… lots of my posts mention them. They are my constant companions, encouraging me to go out for a walk and testing out all my knitted and crochet items. 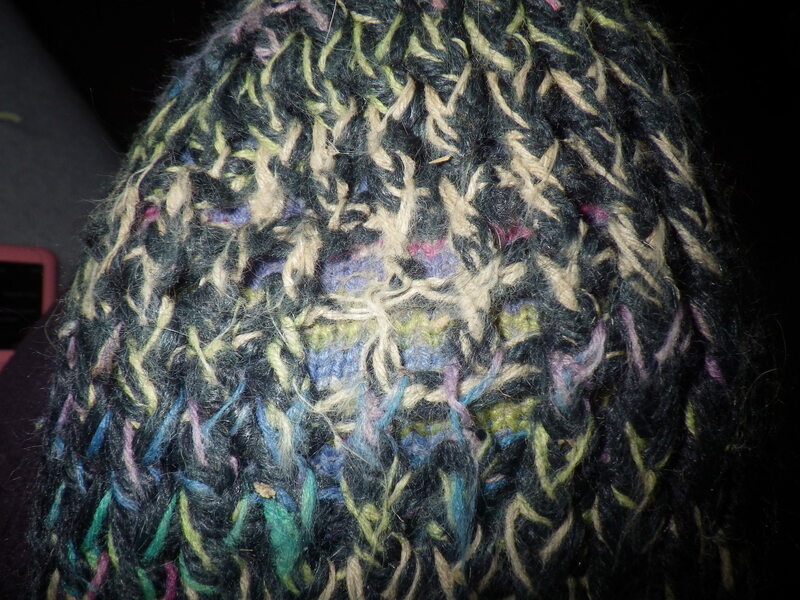 Darning… oh how I hate it, but still it’s a good way to make things last so I do it anyway. Digging… especially keen on unearthing all those lovely potatoes from the garden. Dani… and a host of other bloggers who inspire me. Denmark Farm… where we conserve biodiversity and support community projects. Dark evenings… spent with hook or needles to create lovely woolly things. Dairy… even though I’m lactose intolerant, I’m busy making cheese. Dyson… thanks to secondhand spares from ebay, it’s been mended twice in the past three years. Diploma… my Diploma in Applied Permaculture design was the inspiration for ‘The Masterpiece‘… my amazing friendship blanket. Dehydrating.. and my many other experiments in food preserving. … well, I could go on, but you get the idea. So, here’s to another 500 posts… thank you all for dropping by. How many scruffy dogs can you squeeze into a tiny bed? 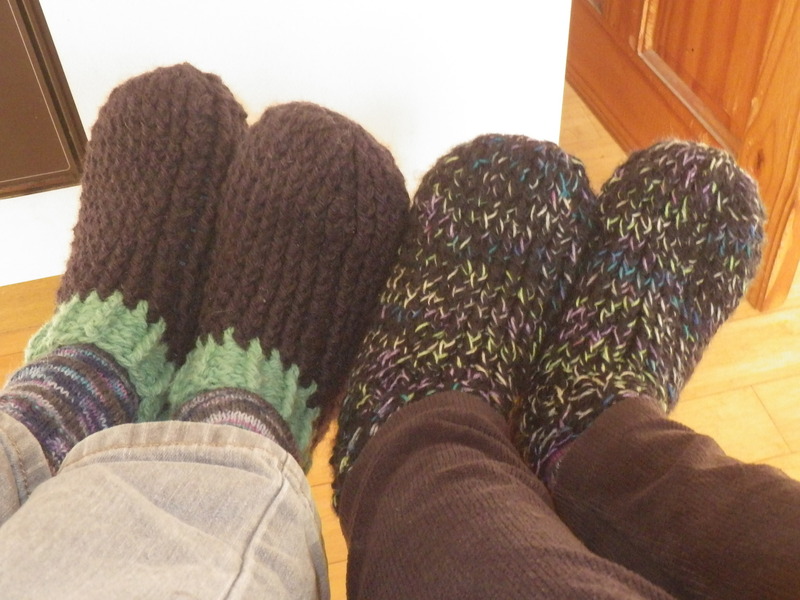 Well, despite my best attempts, Mr Snail-of-happiness’ knitted slippers are not going to last forever. I made a reasonable job of mending the second one this week – using a crochet patch to avoid the hated darning, but I could see that their time is nearly up. It’s partly my fault for choosing a very soft yarn, which turned out to be not very hard-wearing. Never mind, they’ve lasted a year or so and it has given me the opportunity to learn more about different sorts of yarn and slipper designs. 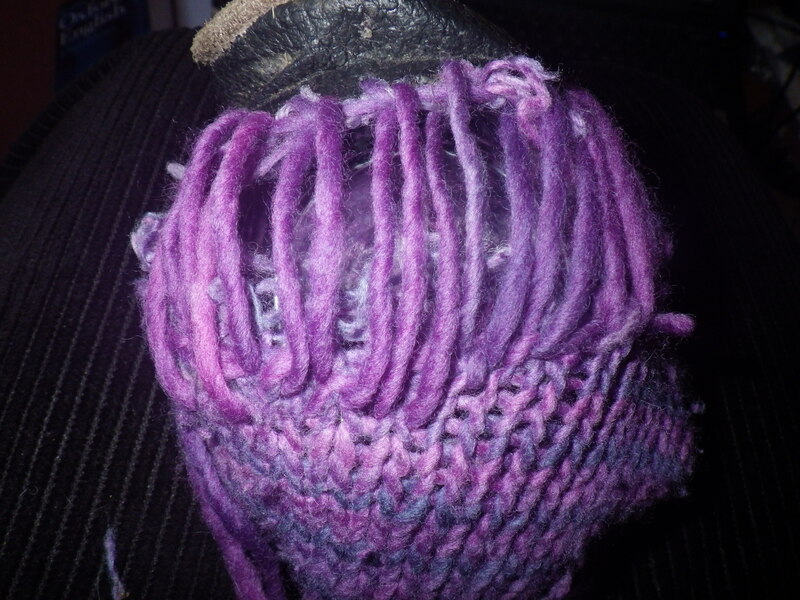 I have a ball of the purple wool left over and it’s going to make a lovely soft hat one day! I’m not going to make the same mistake again: for his new pair, I have chosen a very tough yarn and a lovely adult chunky slipper crochet pattern by Jennifer Dougherty (http://www.crochetbyjennifer.com/). The yarn I selected is another one from Blacker Yarns, this time Pure Whitefaced Woodland Wool, which comes from a rare breed of sheep grazing Suffolk heathland. One of the reviews on the Blacker site said that this is ideal for slippers, and it certainly feels like it’s going to be very hard-wearing. 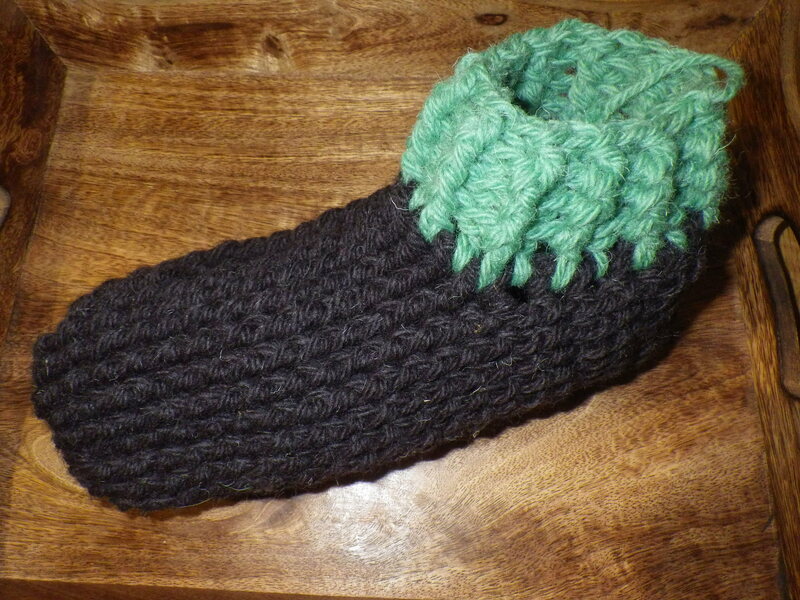 A new slipper… just one so far – he’ll have to hop! The pattern turned out to be very quick to work up and, despite only making a start on the first one at coffee time today, I had finished it (all but weaving in ends) by the evening. It’s a bit tough on the fingers because of the combination of the robust yarn and the main stitch used (front post double [US]/treble [UK] crochet if you’re interested), but I can live with that if it results in a slipper that lasts a long time. I know that I’m a big proponent of mending things, but there is one job that I’m not very keen on and that is darning… I always put it off. However, it’s a useful skill to have* and it is great to be able to mend a knitted garment, particularly one that I made myself and put lots of effort into. 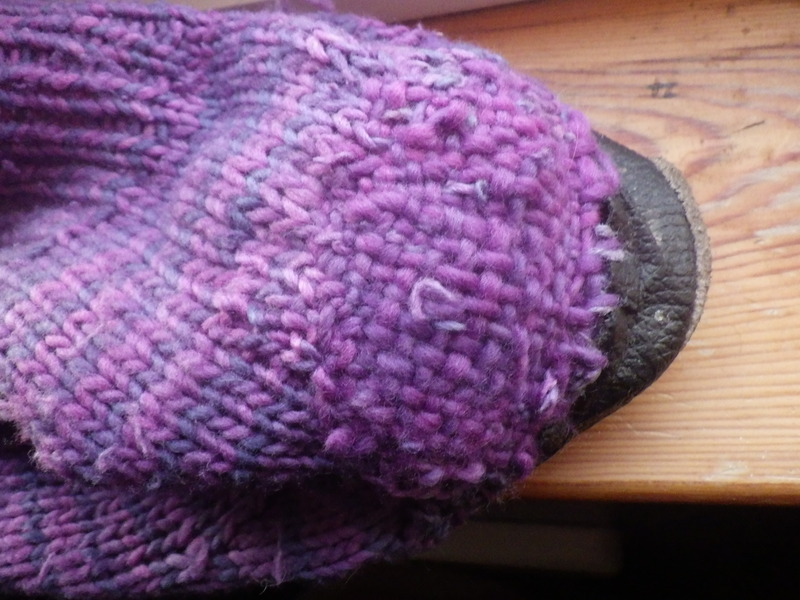 So, it was quite a job to persuade myself to start repairing Mr Snail-of-happiness’ slipper socks. In a way, it’s my own fault they wore out… I chose a lovely soft wool that wasn’t really up to the job. I should have chosen something more rugged; and I will, when I need to knit a new pair, but for the time being I want to keep the old ones going as long as I can. I do have quite a bit of the yarn left, but I think I will use if for a soft, warm hat rather than more footwear! Yesterday afternoon (I really needed good light and it was a nice bright winter day) I settled down with needle and yarn and started the repair. It was a big hole in the heel and he did keep wearing them for a while after it formed, so it had got worse. Sadly, the wool seemed to have no tendency to felt, so I had to do quite a lot of work around the edges of the hole before I could start the actual act of darning. Once I got going, I did quite enjoy it, and I certainly feel pleased that I have managed to eek a few more moths of life out of this particular creation. Next time, though it’s tough Icelandic wool if I can get it! * I don’t intend to give a tutorial, but there’s some great information here.